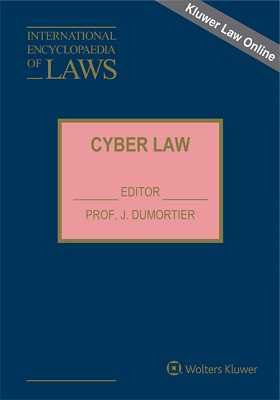 The introduction of new digital information and communications technologies has given birth to a new legal domain, commonly called Information and Communication Technology Law or – more fashionable - “Cyber Law ”. Electronic commerce has led to specific legal problems, for example with regard to evidence, liability, consumer protection or payment. The convergence between broadcasting, telecommunications and digital information technology has created a new platform for public information with all the related legal issues. The Author. Table of Contents. List of Abbreviations. Preface. General Introduction. Part I. Regulation of the ICT Market. Regulatory Framework of the Telecommunications Sector. Regulation of Competition in the ICT Market. Regulation of Cryptography and other Dual Use Goods. Legal Status of Out-of-Court Dispute Settlement in the ICT Sector. Part II. Protection of Intellectual Property in the ICT Sector. Application of Copyright in the Area of ICT. Legal Protection of Computer Chips. Other Intellectual Property Rights in the ICT Sector. Legal Status of Electronic Transactions. Regulation of Electronic Signatures and Certification Services. Legal Aspects of Electronic Banking. Protection of Users of Electronic Services. Regulation of Personal Data Processing. Part VII. Computer Related Crime. Application of Substantive Criminal Law in the Area of ICT.